One of the things I know is that modern banking - in all its forms - is highly dependent on IT. Banks spend a lot of money on IT and develop a lot of their own software. As a result they have a lot of software developers. And I also know that quite a few of these developers and their teams have been, and are, experimenting with Agile working in one way or another. It seems every bank has pockets of Agile, a team here, a team there. And not very often joined up. It also seems - notice we get further and further from fact and more into conjecture as I build this argument - that many banks have cottoned on that Agile is good and can help them. To this end many banks (and this is fact) have established Agile support programmes of one form or another. There are people at many banks who are trying to make the bank Agile - at least in software development. For many of them it is an uphill struggle. In retail banking I think there are grounds to be a little optimistic. The stories aI hear are that Agile pockets are having success and things are gradually, slowly, improving and the efforts to link things up are slowly bearing fruit. In investment banking I’m very pessimistic. I have come to the conclusion that while individual development teams may be successful at Agile for a while inside an investment bank all such teams are ultimately doomed. Your team might be Agile for a few weeks or months or even a year or to, but it will eventually be killed by the bank antibodies. Investment banks are extremely hierarchical in nature; Agile is not. Agile can live with some hierarchy but not investment banking extreme. Short-term in outlook: investment banks are short-term in the extreme - microseconds in some instances. Agile teams can react in the short-term but only by taking a long term view of engineering and quality. Investment bankers are not engineers and do not understand engineering. Nobody from IT ever got to run an investment bank, you don’t get up the ladder from a support function, you get there from selling and banking. A large part of the Agile story is about returning to good engineering principles. The lack of engineering skills, thinking and culture in investment banks undermines Agile. Investment bankers think you can solve every problem with money. Throwing money at Agile can work in pockets (by the best team) but doesn’t last or scale. Investment banks are individual focused: individual bonuses, the power of the one trader to make money or break the bank (from Kweku Adoboli to Nick Leeson and before.) Agile is team focused. Investment bankers think applying more pressure is the way to get results; Agile people now that applying pressure breaks things. A little pressure can help but apply too much and things snap, bankers don’t get engineering so don’t get this. Risk aversion: yes, investment banks are highly risk averse when it comes to IT. Perhaps because they take so much “risk” directly with money they very risk averse in their operations. Investment banks are contradictory: they say they embrace and manage risk but actually they are risk averse (at least in operations); they say they value the team but their actions say otherwise; they call themselves “financial engineers” but they no nothing about engineering; and so on. Agile is about honesty, facing up to truth and acting on it. Investment banks recent track record shows that honesty is sometimes questionable, to say the least. I’m sure many of you reading this will say “Rubbish, I know at team at ....”. I am sure you do. While that team might be successful for a while the investment bank culture will eventually kill the team. So how can we help investment banks overcome this problem? We can’t. Its the way it is. Take the money, and run, or keep you head down and hope for some more. Eventually new financial institutions will emerge which get Agile, not just at the software level but elsewhere. These institutions - which might be banks or might take some other form - will eventually replace the investment banks. This is going to take time. Investment banks are fundamentally a broken business model which are propped up by Government support and market failure. This means normal economic logic does not hold for these institutions. In the last few weeks Michael Barritt of Oxford Innovation and myself have presented several versions of “Agile in Cornwall” - a case study of our work introducing Agile to companies in Cornwall. All three versions of this Agile case study presentation are now on my website. I recommend the latest two version - Agile Business Conference and Agile Cambridge. The version from Agile on the Beach in Cornwall was supported with presentations from two of the companies concerned - Research Instruments and Sullivan Cuff Software. In fact, you can find my own case study of the work at Sullivan Cuff on the Software Strategy website. A video version of this will be available in the near future. If this interest you, or you want to hear it not read it, then I’ll be doing a revised version of the presentation at Skills Matter in a couple of weeks - “Agile Cornwall case study: How the EU is helping Cornish companies get Agile” - a free event, registration required. The contents of a release can - and would - change. But the company felt it knew what it wanted and since the team knew their velocity they could take a stab at which release it would be in. If something new was added the question was simply: when in which release do you want it? And the related stripe on the chart would increase. That by the way is why the three strips of work yet to do are approximately equal size. If one grew it was obvious, work needed to be removed - either thrown away, or moved to another release, perhaps one that didn’t appear yet. Continuing from my last blog entry (Burn-downs are not just for Sprints) I’d like to offer some advice on the subject, burn-downs, cumulative flow diagrams, velocity, etc..
1) Don’t track hours. Hours are input and its better to measure outputs. Hours are subjective, see my Humans can't estimate tasks blog. Worse still we have too many psychological hang-ups about hours to make them usable. Instead you want your own currency, call them story points, abstract points, nebulous units of time or what ever you like. Having your own currency allows it to adjust to your team. Each team has its own currency. Its like having the dollar, euro and pound. They all float independently, there is an exchange rate but it changes. 2) Draw your graphs by hand, process your data by hand. Get a feel for your data. Unless you have a feel for the data and an understanding of how it comes to be you can’t reason about it. When I say “by hand” I allow you to use Excel (or similar), graph paper is better, but whatever you use don’t use a tool like Rally, Version One, etc. because you won’t have a feel. Jack Kilby, co-inventor of the silicon chip and pioneer of the electronic calculator, lamented that his invention(s) deskilled engineers. Before the calculator engineers used a slide rule, this meant the engineers needed to know where to put the decimal point. They needed a feel for the data. Kilby lamented that the calculator meant engineers didn’t have the same intuition because of the calculator and led them to make mistakes elsewhere. 4) Use estimated data, forget actuals: estimates and actuals are apples and oranges, or rather, they are future facing estimates and retrospectives estimates. Estimate tasks just before you do them (e.g. iteration planning meeting), put ball-park estimate on stories which you aren’t going to do any time soon (i.e. later than this iteration), and use averages for really long term stuff. When you break the stories into tasks, or epics into stories, don’t expect the numbers to match. In fact, you might want to track the variation for longer range forecasting. 5) From 2 & 4: if you have a time-tracking/time-sheeting system leave it to one side, let it exist in its own little fantasy bubble. Don’t use the data, its toxic - see my entries on Capers Jones work. Live by your velocity measurements and charts. Ultimately, burn-downs are about capacity measurement: John Seddon in Freedom from Command & Control talks about creating capacity measurement charts within organisations. 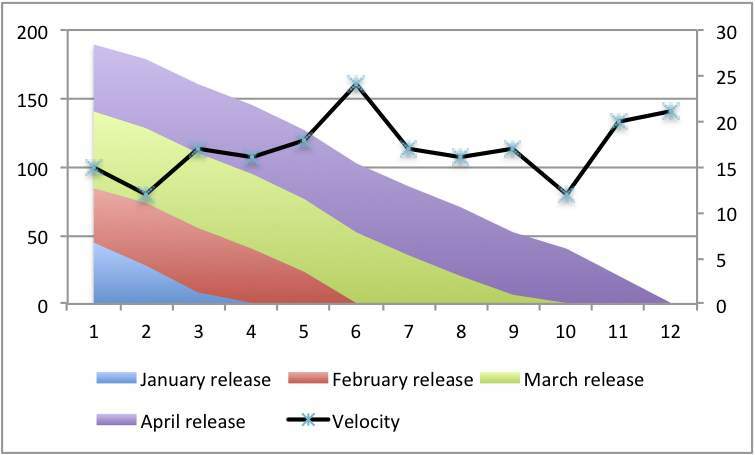 The various graphs we use in Agile are our version of capacity measurement. Accepting its about capacity measurement means its not about targeting. Targeting is wrong see my entry form last year - Velocity targeting and velocity inflation - for more about this. Capacity charts - usually burn-down, burn-up or their cousins Cumulative Flow Diagrams - are amazingly useful things. They show you the state of a development effort. They show this in data. Data by itself is hard to reason with but put it in a graph and wonderful things happen. Except on the smallest pieces of work there will be something coming next and a product burn-down can give a good sense of context, overall progress and, most importantly, when you could be finished - especially important on large pieces of work. Armed with this information you can construct sensible release plans. The key thing is, without this data, velocity and burn-down - and the graphs to understand it - each sprint exists in isolation. That might be OK if you are delivering every sprint and you don’t need to peek into the future. But the kind of work I see does need to look forward and this information is essential.